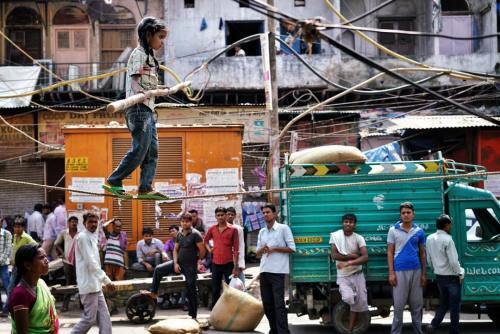 Karina, a 6 year old acrobatic street performer, crosses a hemp rope high wire in the middle of a busy market street. From the outskirts of Delhi, Karina comes from a community called Nat, a nomadic people who were originally jugglers and dancers. #onassignment #photojournalism #documentary #reportage #streetphotography #newdelhi #PeregrinAdv #helloworldRELAY #India" By benlowy on Instagram.